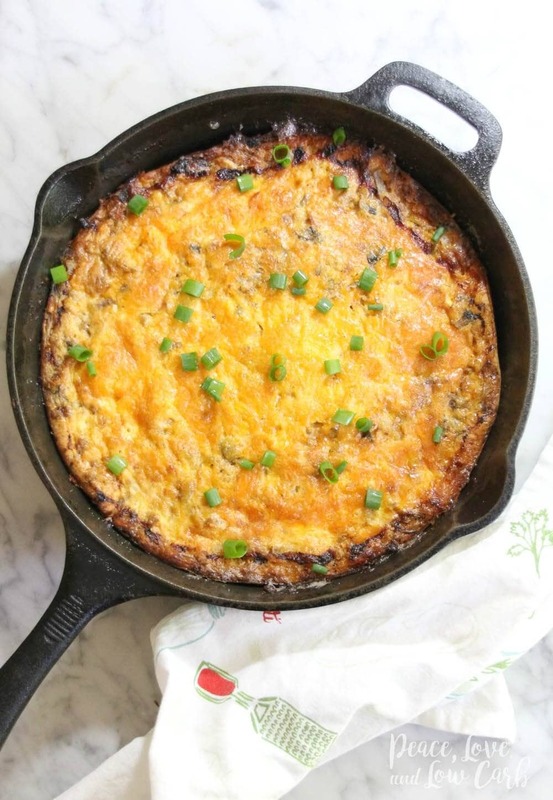 Quick and easy low carb skillet breakfast. It also makes for amazing leftovers. Keto Spicy Sausage and Caramelized Onion Breakfast Bake. 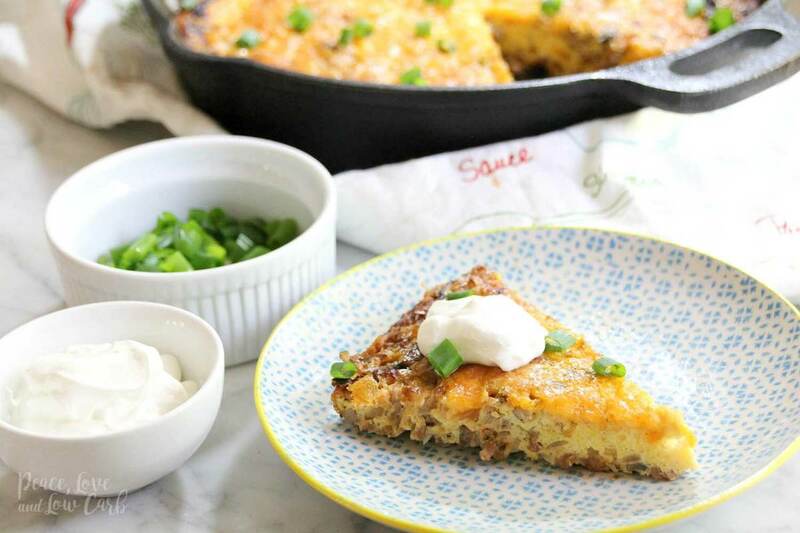 This Keto Spicy Sausage and Caramelized Onion Breakfast Bake is one of the very first recipes I started making when I set out to live a low carb lifestyle. All of these years later, it is still a family favorite. It’s the kind of dish I have to double if I want to have any leftovers. But speaking of leftovers, this is one of those dishes that just gets better and better each day. Many people on a low carb diet quickly get tired of eating eggs. Sometimes it is all about mixing things up and not just eating boring fried eggs day in and day out. 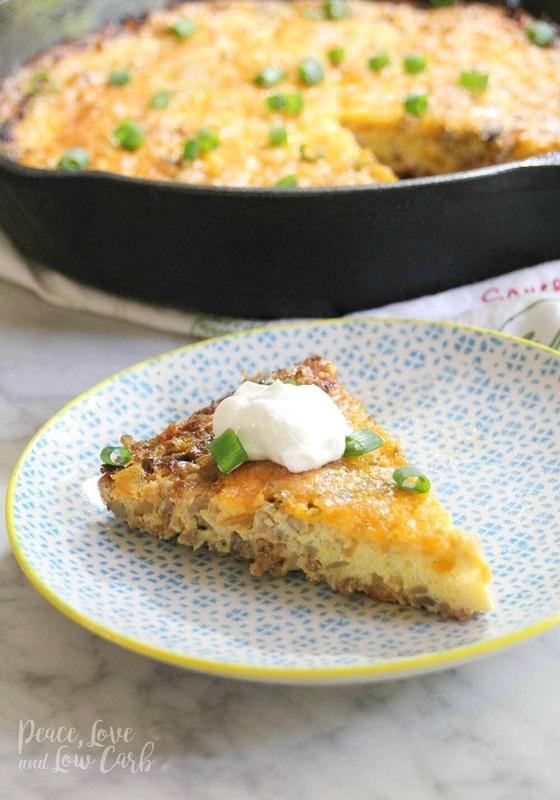 This low carb and gluten free breakfast bake is the perfect way to do exactly that. I love the way the cheese mixes in to the eggs, but also floats up to the top of the egg mixture to form a delicious crust. It’s like eating a low carb quiche recipe, but without the crust. Mmmmmm! I love to top this with a dollop of sour cream and a sprinkling of fresh chopped green onions. The cool and creamy sour cream pairs perfectly with the flavors of the spicy sausage and caramelized onions. If you are looking for an easy one pot keto recipe, then this is the dish for you. Hey, it’s not just for breakfast either. In our home, we are big fans of brinner – breakfast for dinner. In a large sauté pan over low-medium heat, add onion, butter, garlic, and salt and pepper. Cook until onions are nice and caramelized – About 20 minutes. While the onions are cooking – In a large skillet, brown the sausage. Once the sausage is nearly finished cooking, add mushrooms, tomato paste, and hot sauce, and sauté 5-10 more minutes. Mix caramelized onions into meat mixture. In a large mixing bowl, crack all 10 eggs and fork whisk. To the eggs, mix in cheddar cheese and Parmesan cheese. In a 2 quart glass baking dish, pour meat into the bottom of the dish and spread evenly. Pour egg mixture over the top of the meat. Use a fork to poke holes down into the meat to allow the eggs to mix just slightly into the meat. Bake for 40 minutes. Once finished, the top should be a nice golden brown color. Holy cow that looks awesome. I just might have to try it! This one looks delicious but I would skip the “hot” sausage and the “hot” sauce . I do not like “hot” stuff. I will let you know. I’m pretty sure that it’s going to be as delicious as the “hot” one. Thanks again for your recipes………. Sounds SO good. Will be trying this soon! This looks delicious with easily accessible ingredients! Might have to give this a try, but since I’m the only one in the house that would eat it (husband is very picky with food), I will probably scale down the recipe to a smaller ovenware size. Made this for some overnight guests for breakfast. It was a huge hit! No sausage fans in this house. Any ideas on what I can use as a substitute? Maybe used ground beef or maybe a chicken or turkey sausage? Hmmm….the ground beef or maybe even ground turkey would be good. Thanks!! Thanks so much for creating such yummy, low carb recipes. I follow a Ketogenic diet, so your website is very helpful to me. I track my diet on SparkPeople.com so I added this recipe to their database and said I had adapted it from yours at peaceloveandlowcarb.com. This was AMAZING! Been eating low carb for four months and stumbled across your recipe and blog. So yum!! I did make a couple substitutions. I don’t like sausage or mushrooms so I used ground beef and tomatoes instead. Delish! Thanks for this recipe. My husband loves this and it’s his favorite breakfast! We have also enjoyed many of your delicious soup recipes, I especially like the Reuben soup! You do a great job creating low carb, grain free recipes that are so satisfying. Keep up the good work! I have already purchased one of your cookbooks and have my eye on another. I made this today. I didn’t have any hot sauce so I used chipotle sauce instead. It was so good. I am not a lover of eggs but the cheese/egg ratio is tasty. I am going to check out some more of your recipes and your site. Thanks for the recipe! It is a keeper! OMG this recipe is a lifesaver. I’m not a fan of eggs and of been struggling to find things that are not replacement carb-based to eat for breakfast. I made this two days ago and I cut it in half just in case it sucked. Now I’m kicking myself I should’ve made two batches because I am obsessed and my entire family loves this. Confession: I did add 1 tablespoon of coconut flour And a couple tablespoons of cream just to make sure that it wasn’t overly eggy and I made them as muffins so they’re easy to grab and go.. These will always be in my refrigerator. Thank you! I love caramelized onions! This looks fabulous!